A lot of work goes into creating an online comic book, or ANY comic book, for that matter. A lot of times during the creative process, I will find myself using character sketches and art that wasn't originally intended for any certain purpose. 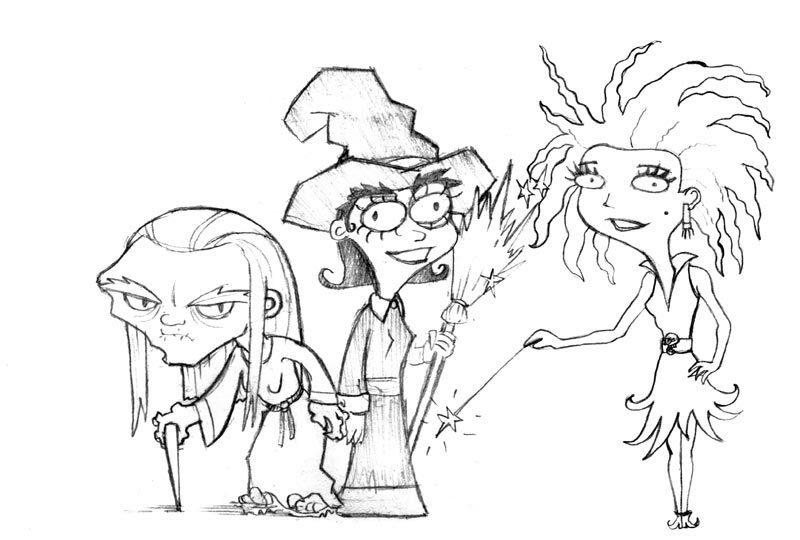 For 3 Witches, I came up with idea when I sat down and decided I would try my hand at more cartoony characters, rather than the (slightly) more realistic characters of my other online comic, Legends. What came out was three very strange looking witches that I immediately fell in love with. I began sketching out my new comic right away, filled with inspiration. 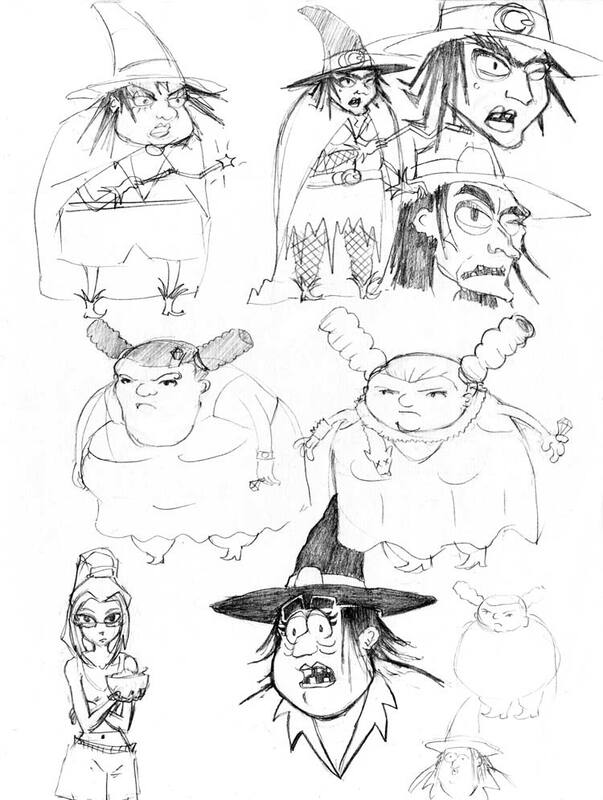 Here are some of the original sketches done during the concept phase of 3 Witches. I will continue to post new art as it becomes available. 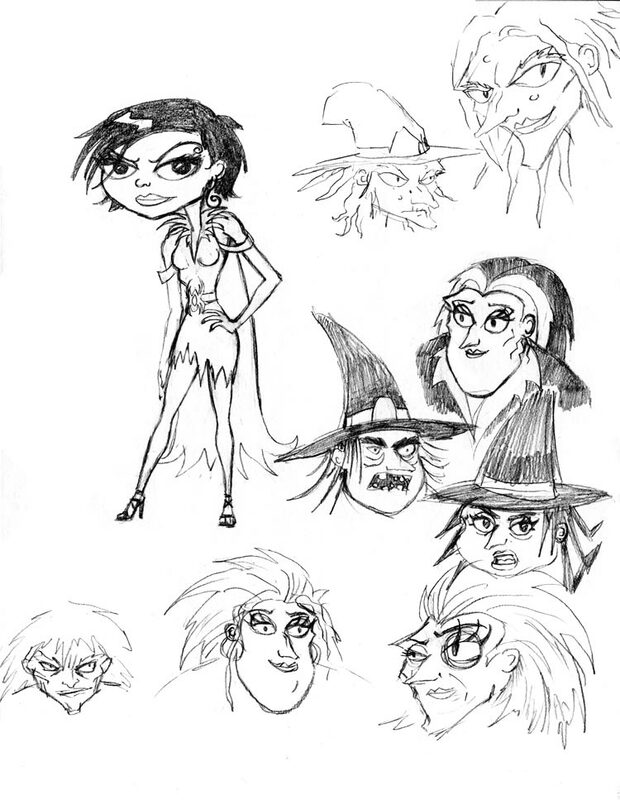 3 Witches Concept Art - This was the original drawing that started it all. It was July 2005, and I was thinking about getting into freelancing, and I had thought about doing some children's books. 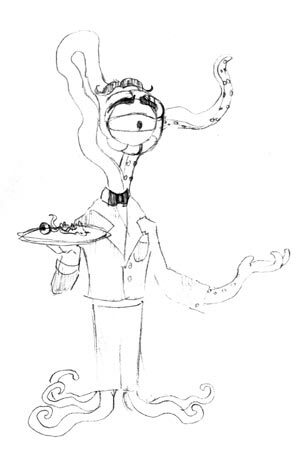 I didn't have much in my portfolio that look like children's book drawings, so I doodled out the first character, who I named Gruel. This idea clicked that she was a witch, and that she should have two other witch friends. So, I drew Betsy, who was the goofy one. I had some trouble with Tartella, because with Gruel's obvious temper and constant scowl, and Betsy's total goofiness, I needed to come up with a character who was completely different. So, I came up with Tarty, who is the strange one, and the more self-centered one. 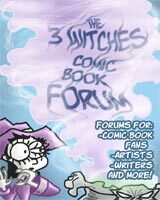 Forgetting about freelancing for awhile, I immediately started on the comic book, "3 Witches." The Old, Spooky House - Having three great characters, I had to come up with somewhere for them to live. 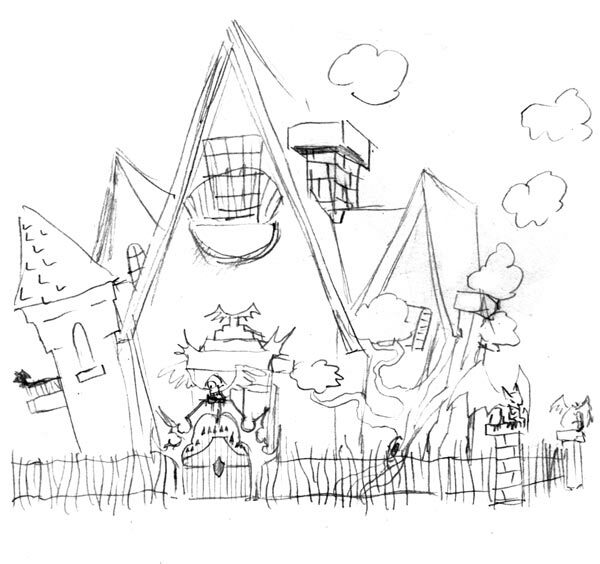 I then did a quick sketch of an old, rickety house. One that would be fit for three nutty witches to live in. Sabel, Frances, and Starla - My first concept of Sabel Screechley made her look a little rougher, and more unrefined (not that she's not unrefined in her final look). I kind of did her as a side thought at first, still coming up with new ideas for supporting characters for the comic book. Here I also have the first Starla drawing, which I stuck with as her final look. I also have the final sketch of Frances, who I also had a little trouble with finding a look for. More Sabel Concepts - I wasn't satisfied with the first look for Sabel, so I decided to try other approaches. I even had a young and beautiful version of her. I didn't like the idea of making the 3 Witches' rival a young, snobby girl, because that to me isn't very interesting. You can also see other ideas I toyed around with here. Final Sabel Sketch - I prefer the dirty redneck Sabel, because she seems like she could really do some damage, if provoked. Larry - Okay, so I'm warped. 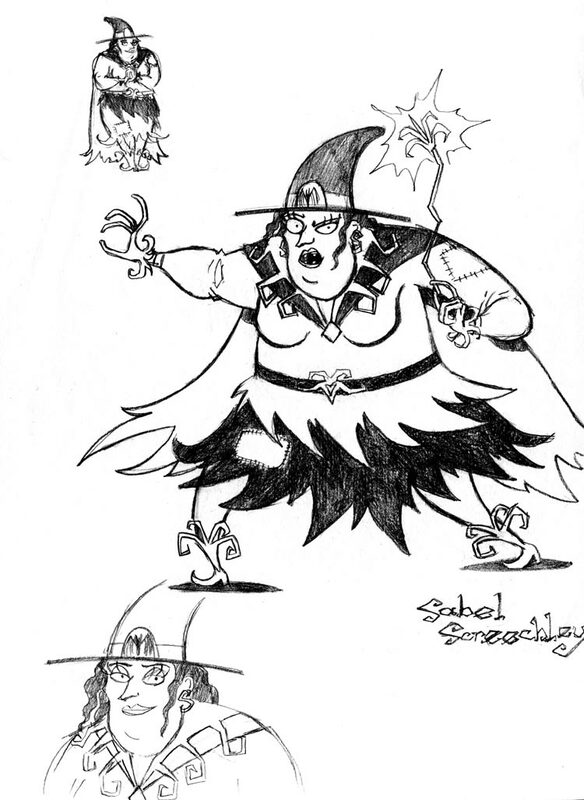 Larry started out as the 3 Witches' butler in Witchville, who was going to turn against them later on, but I decided that Sabel needed some kind of evil cohort to help her carry out her plans. I kind of turned Larry into a squirrelly, nervous sidekick to Sabel, to make him more interesting. Sally, Jane, Frances, and Demon Baby - So sue me, I changed the plot again. 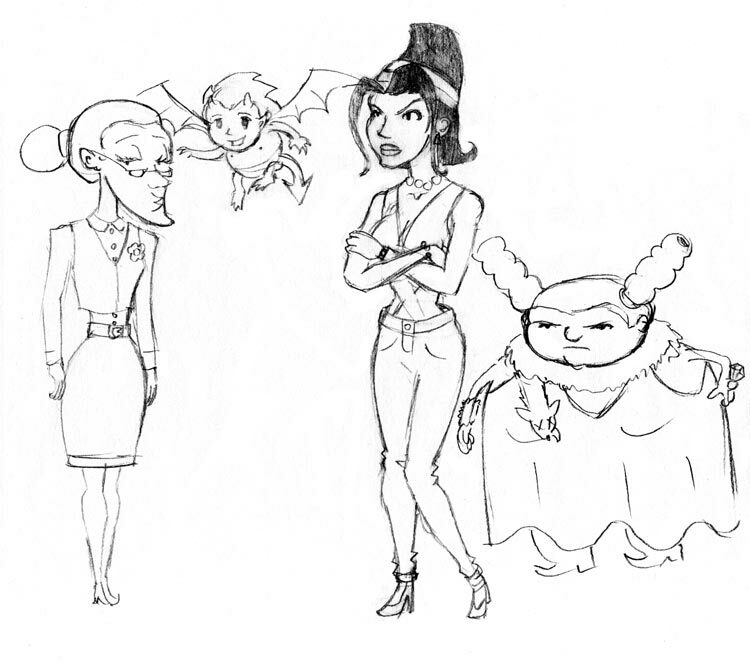 This was the final sketch of Sally, Jane, and Frances, with a Demon Baby that I was going to have them discover in Witchville once they arrived. I have pretty much dismissed that idea at this point because they aren't central characters in the story, but I may have a wild hair and write that story one day, who knows?